Thanks to an elegant new bridge over Lake Shore Drive, in the shadow of the Stephen Douglas memorial pillar, it’s now possible to bike directly down 35th Street from Bronzeville to the Lake Trail. Billed as the city’s longest pedestrian bridge, spanning 620 feet and six Metra and South Shore Line railroad tracks, the single-cable suspension bridge was officially opened last week. It’s the first of five new bridges planned over the drive on the South Side. Designed by Teng and Associates, the S-shaped span replaced a rusty old bridge build in 1933, which required users to climb a set of stairs and one end and descend a staircase at the other, making it impassible for wheelchair users and inconvenient for bike riders. The new bridge has a 20-foot-wide deck, and the A-shaped center support pylon is about 120 feet tall. The $26 million project was bankrolled with federal and state funds. The bridge creates a new connection to a new arts and recreation center at Ellis Park, featuring a gym with basketball courts, an indoor pool, rooms for art and education programs, a fitness center and studio, a meeting hall, and music and theater performance spaces. The Chicago Department of Transportation, which completed the projects has four other South Lake Shore Drive bridge projects in the works, including a new pedestrian bridge at 41st Street slated to start construction next spring. A third pedestrian bridge will replace the existing non-wheelchair-accessible pedestrian bridge at 43rd Street. CDOT is also finalizing designs for the replacement of two all-vehicle bridges over the railroad tracks at 31st Street and 39th Street. The 35th Street bridge makes it that much easier for Bronzeville residents and other Chicagoans to access the lakefront for transportation and recreation and, in this writer’s opinion, the graceful design represents a new gem in Chicago’s architectural crown. What do you think of the new facility? Let us know in the comment section. Renderings of Lakefront Trail separation between Oak and Fullerton were recently released. Here are some thoughts on how this will function. 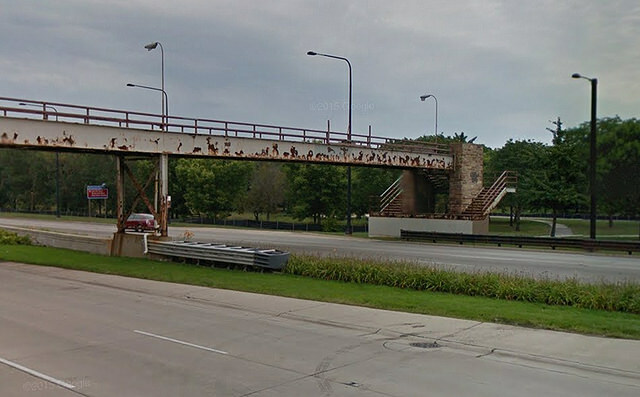 Take it to the Bridge: Is an Overpass Needed at Monroe/LSD?